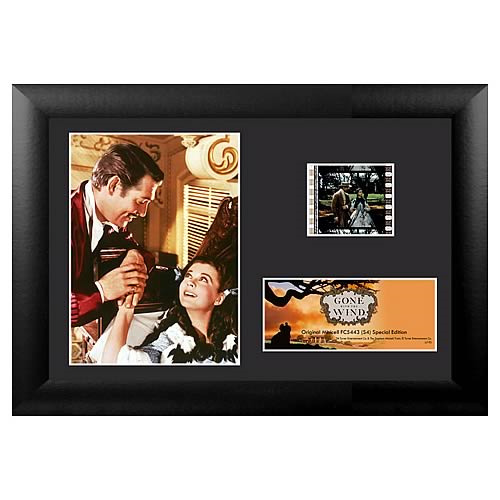 Own a piece of Gone with the Wind! Features Scarlett and Rhett, beautifully mounted and framed! This amazing film cell features prints and actual cells from Gone with the Wind. Measures 5-inches tall x 7-inches wide. Perfect for displaying in your home or at the office, all the elements are framed in black wood and includes a certificate of authenticity. The epic tale of a woman's life during one of the most tumultuous periods in America's history. From her young, innocent days on a feudalistic plantation to the war-torn streets of Atlanta; from her first love, whom she has always desired, to three husbands; from the utmost luxury to absolute starvation and poverty; from her innocence to her understanding and comprehension of life.